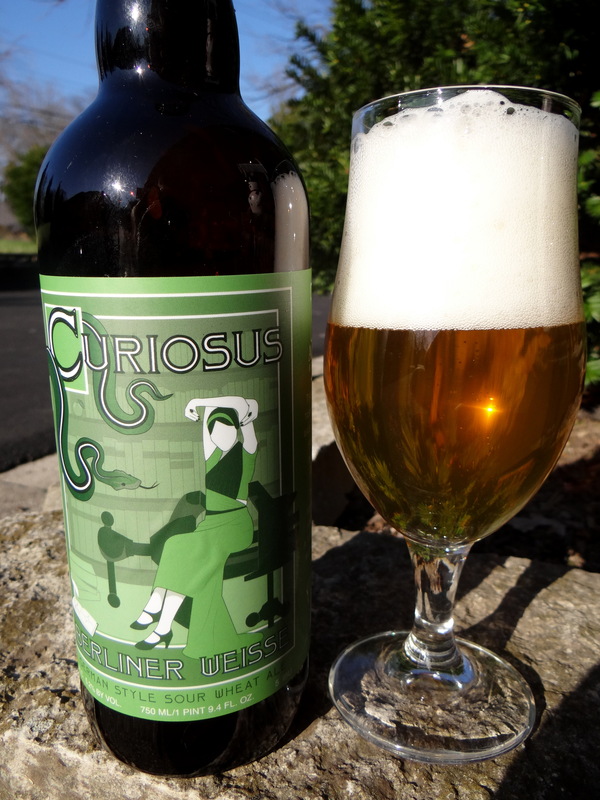 The latest beer released by Columbus’ Actual Brewing is a Berliner Weiss called Curiosus. Aside from the occasional German import the only readily available Berliner Weissbiers I’ve come across when perusing Central Ohio stores are Festina Pêche by Dogfish Head (a summer seasonal), Oarsman by Bells, and Hottenroth by the Bruery. In fact I’ve never seen an Ohio brewed Berliner Weiss. Searching the rolls of the Beer Advocate I see that Jackie O’s makes one, but its availability and distribution appears to be quite limited, as is the case for all of the bottled Jackie O’s beers. So Actual Brewing is breaking new ground in the Ohio beer scene with the release of Curiousus. Though to be fair their distribution is also rather limited at the present time. Before getting into this beer let’s bring those readers who may not be familiar with the Berliner Weiss style up to speed. As the name implies it is a wheat beer that originated in Berlin, and has been around since the late Middle Ages. This style combines low alcohol levels (3-4%) with a tart, slightly fruity flavor, and a bubbly effervescence. Napoleon referred to it as the “Champagne of the North” when his troops occupied Berlin. The tart/sour character comes from the presence of lactic acid, which is produced by adding lactobacillus bacteria (also used in making yogurt) during fermentation. In Berlin it is common practice to serve this beer with a dash of sweet syrup, either Waldmeister or Himbeer, to take the sour edge off. Waldmeister, which is extracted from an herb called Woodruff, imparts grassy and lemony flavors, while Himbeer is German for raspberry. 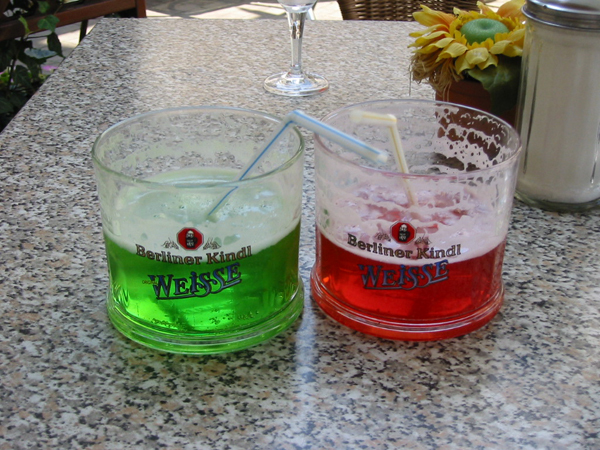 These syrups give the beer green and red hues, respectively, colors that are rarely seen in the world of beer. As is the case with all of the Actual beers the label is a striking artistic rendition that features a faceless woman and an animal, in this case a large python-like snake. The beer is a pale straw color and is initially quite effervescent giving a big fluffy white head that dies off to nothing after a few minutes. The aroma is tart and fruity with notes of green grapes, apples and lemons. The taste follows the nose quite closely, light fruits balanced by a tart acidity. There is a pretty good balance between sweet fruity flavors and tart notes from the lactic acid, although I think the beer would benefit if the sour flavors were dialed up a little. The mouthfeel is light bodied as is appropriate for the style, but it falls a little short of the tart, crisp finish that would be ideal. I don’t know if it needs a little more lactic acid, a little more carbonation, or perhaps a little more of both. Berliner Weiss beers from Germany with Waldmeister (left) and Himbeer (right) syrups added. Kudos to Actual for brewing a decent rendition of a hard to find style. It’s easy drinking, light and refreshing, characteristics that make it well suited for the hot days of summer that will eventually come. I’d opt for Curiosus over both Festina Pêche and Oarsman, but I don’t think it measures up to Hottenroth. No shame in that verdict though, The Bruery makes excellent beers. The lactobacillus probably need a little more time to do their magic, lowering the ethanol content and simultaneously raising the lactic acid concentration. For those of you who haven’t ventured into the world of Berliner Weissbiers, I will say they are great for a weekend breakfast/brunch. The low abv and tart, refreshing taste are well suited for morning imbibing. So next time you are tempted to go for a mimosa, instead reach for a Curiousus. Add a little raspberry puree in the glass for a striking red color and throw some Kaiser Chiefs on the CD player to indulge your inner Prussian. Good review – keep those Ohio Brewery reviews coming. And let me know if you want more information on our Brewery Tours. Cheers and Prost! Jim, thanks for the comment. It’s always nice to get some feedback. I’ve got several local beers in the refrigerator, so you can be sure there are more reviews on the way. Doing one of your tours is on my list of beer-related things to do. Do you have a favorite?